As I walked home late one night last week, I came upon a scene that perhaps many of us are familiar with. In a dark corner of a quiet area there lay a pair of new looking shoes, laced up and stood together, as if worn by a phantom man (they were a man’s shoes). There was something jarring about the scene. The shoes were too clean to really “belong” on the street, but yet there was nobody in sight, and who goes home without their shoes? After a moment I walked on, of course, but the image stayed with me. I couldn’t help thinking about the circumstances in which those new shoes came to be on that dark street corner. There was no doubt about it, they were out of place. What exactly does it mean for a thing to be out of place? Some things seemingly make sense in one environment, but not another. It is not simply a question of us being accustomed to seeing certain objects in certain places; if those same shoes had been dirty, or soaking wet, I would probably have walked past them without giving them a second glance. Shoes are perfectly welcome on streets, so long as either they have feet in them to lead them elsewhere, or they have somehow “become” part of the streets themselves. In the case of the latter they will have taken on characteristics of the environment around them, making them seem to be more at home in it. Things appear to be out of place when they objectify two different material registers without offering a connection between them. The clean amongst the dirty; the new amongst the old; or a cherished possession amongst the discarded (a teddy bear in a landfill is a famously sad example). Coming upon a thing such as this produces a feeling that is at once inquisitive and uncomfortable. It is the absence of material connection that is felt. Artists know the power of this absence, and use it to produce certain effects. 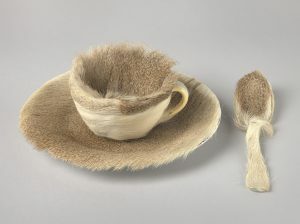 Object, a work by surrealist Meret Oppenheim, consists of a cup, plate and saucer lined with Gazelle fur. As a container for liquid, this cup is of course useless, and the uncomfortable feeling of fur on the tongue is immediately brought to mind. Oppenheim constructs a conflict between material registers – fur and porcelain cease to be separated, as do comfort and practicality, while materials meant for one part of the body are offered to others. The absurdity of such a design, coupled with people’s sensuous familiarity with these items forces the viewer to engage with the relationship between materials and context. The absence of material connection produces a certain kind of presence. It is the presence of the unknown. In the case of the shoes the registers of domesticity and the urban night come together but do not conjoin, because the material relation between them is unclear. Was I missing a drunk man, or a dead man? Perhaps all I was missing was a box, which had fallen out of somebodies bag and become separated from its contents. Any of these (for better or for worse), would have united the two contradictory materialites. What was absent would have allowed the material world to flow. Out-of-placeness can fill us with a sense of curiosity or dread. It also awakens an artistic comprehension, making us more aware of the characteristics of the material world that surrounds us which otherwise recede into the background. That night I missed the person in the shoes, as much to make sense of the scene as to know that he was safe. Material culture transforms the human relationship with the world. Through these everyday encounters we are reminded that how and what we see in the world around us depends on what we expect our things to do, when often they insist on doing something else.